cosmelan® is an effective hyper-pigmentation management programme, consisting of both professional treatment and home care. The protocol will be tailored to your condition by your skin care professional. What is cosmelan® used to treat? Cosmelan is used to treat hyperpigmentation, a very common skin disorder. It presents itself in brown patches, often found on the hands and face, leaving the skin blotchy and uneven. It is caused by a genetic predisposition, hormonal influences (such as pregnancy, menopause and oral contraceptives) and exposure to the sun. “For 16 years I have literally tried every treatment for pigmentation (including laser, peels and skincare products), with no lasting results. I felt deflated and began to accept that it was something I’d have to live with. Then I had the mesoestetic demamelan treatment. The results were truly unbelievable. cosmelan® acts by blocking the melanin-producing enzyme (Tyrosinase), therefore reducing the production of Melasma. A significant reduction in brown patches may be detected only one week after starting treatment. The appearance of new, luminous and rejuvenated skin is present, and skin continues to improve with the use of the maintenance products. What is the cosmelan® procedure? cosmelan® is a professional treatment and must be administered by a qualified and experienced practitioner. Both cosmelan® and dermamelan® contain the same active ingredients to treat hyperpigmentation, while dermamelan® is slightly stronger. Phase 1 Preparing your skin pre-procedure. The better your skin is prepared, the better the result and the lower the risk of inflammation or discomfort. The mesoestetic Brightening Booster is recommended to be used for 6 weeks prior to the the treatment, and mesopeel Melanostop 48 hours before the ask application will provide an added benefit. Phase 2 The in-clinic treatment which takes about an hour, and involves the application of the cosmelan mask. Once the mask is applied, you will be taken through the protocol carefully and you will be able to go home. You will be instructed to remove the mask after a specified period of time. 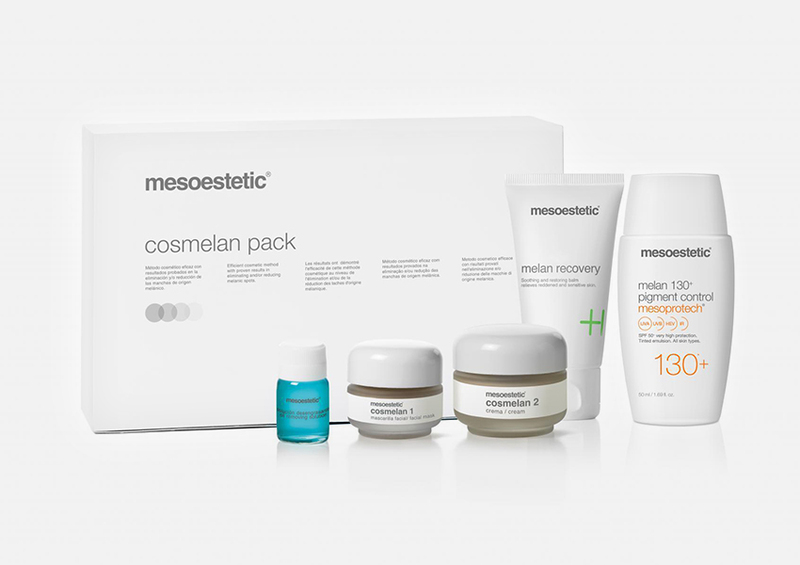 Phase 3 the maintenance period over the next 12 months, which is critical to the success of the cosmelan treatment. You will be prescribed home care products and given careful instructions to follow to best maintain your result. Home care products during the first month include: mesoestetic’s Mesoprotech Melan 130+ Pigment Control, Melan Recovery and Cosmelan maintenance cream. During the next 11 months, the following products can be added: mesoestetic’s Fast Skin Repair, Stem Cell Serum, Aox Ferulic, Regenerance Active, Proteoglycans and Anti-stress Face Mask. It is recommended to consult with a professional to discuss possible results, following a thorough skin diagnosis. In many cases a reduction in brown patches may be detected as soon as one week after starting treatment. Once peeling is complete, the skin will appear more luminous and rejuvenated, and should continue to improve with the use of home care products.